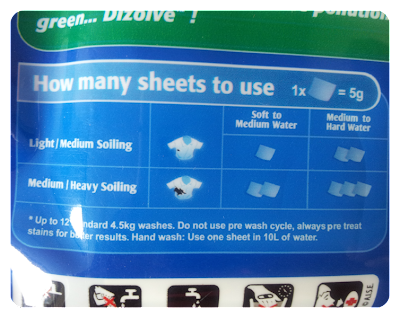 When I received Dizolve non-bio washing sheets to review I was astonished by just how compact the packaging was making it easy to store and therefore kinder to the environment too. So many tubs of washing liquid and powder are huge and heavy making them hard to fit under the sink with everything else that's required for a tidy home. But Dizole use 80% less packaging which means there are less lorries on the roads and less pollution aswell! The resealable packets contain 12 non bio sheets (there are bigger packs too) which are super concentrated and enough for 12 full loads or 24 half loads of washing. It's great that you don't have to measure them out and they are less messy too.... the kids can get domesticated (they love to help pressing the buttons and turning dials!) without worrying about spillages on the floor and work surfaces! You can use them with a warm or cold wash too. We were sent both Fresh Linen and Lavender to test and despite not being keen on Lavender they were fragranced nicely and weren't overpowering. I even let the neighbours have some packs to try - they were impressed too with the scent and results! 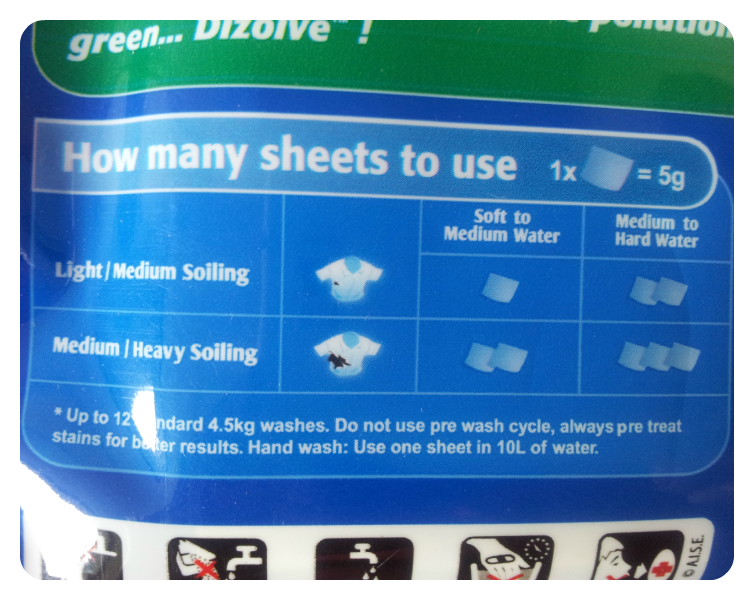 The instructions are very easy to follow with a 'How many sheets to use' diagram on the reverse of the pack stating how many you need to use depending upon the soiling of the clothing you are washing and the water (medium or hard) that you are washing with. I had worried originally whether such a small sheet, around A5 size, would clean a full load of washing and whether it would leave a sticky residue on the items. However the clothes I washed came out smelling really fresh, just how I like them, and there weren't any bits left stuck on the clothing anywhere. I've used them several times since and I'm very pleased with how they clean dirt and food from everything. I would actually purchase these in the Linen Fresh scent and use them in the future, they barely take up any room in the cupboard, they make my clothes smell lovely and they are easy to use. Anything that makes housework easier is good in my book! For more information on Dizolve you can head to their website. Dizolve is available at selected Waitrose Branches and is on promotion with Tumble Tots. I use these and love them too! My mum says these are great.